Your arrival to Hawaii isn’t too far away…. As you prepare for your PCS to Hawaii, allow Hawaii VA Loans to not only make the transition easier for you, but to put you a step ahead in Hawaii’s real estate market! How so? It’s quite simple. If you’re interested in becoming a Hawaii homeowner using your VA loan benefits, get pre-qualified and pre-approved before you arrive on island. Take Hawaii VA Loans Home Buyers Jesus & Rikki, for example. They were pre-approved prior to PCSing and worked virtually with their real estate agent who did a video walk-thru of the home they purchased – all before arriving to Hawaii! It’s the first step (besides making the phone call, of course)! The pre-qualification process can take as little as 15 minutes over the phone. Getting pre-qualified means that you’ve contacted a VA Loan Specialist, allowed them to review your credit, and provided them verbal information about your assets and monthly income. An approximate monthly payment for the proposed loan is determined by taking a look at your debt-to-income ratio (how much you make vs. how much you pay out in monthly expenses each month). Pre-qualification is simple, but it also adds a level of risk that the verbal information given may be misinterpreted. Therefore, once the VA Loan Specialist has reviewed your actual income and asset documentation, you’ll be on your way to pre-approval (see below). This is when some may find that they no longer qualify for a loan at that particular time. Do not be discouraged! You will be advised on the steps you need to take to become qualified. For example, are there any credit issues you can resolve? Getting pre-approved takes the VA loan process a big step further. We’ll need to obtain your Certificate of Eligibility to verify your VA loan entitlement. Now is when you’ll need to provide that documentation for review in order to verify the figures provided verbally during pre-qualification. Your VA Loan Specialist will make any adjustments to income and assets per the verification of documents and submit the loan through an Automated Underwriting System to determine your approval and eligibility. As a result, this process will give you a pre-approved purchase price that you can confidently house hunt and plan for. Pre-approval is much more thorough and gives both the borrower (you), and the real estate agents involved, the added assurance that your financing should move very smoothly. Most recent 2 years of Federal Tax Returns (including all schedules & W2s) MAY be required. Most recent 2 months of bank statements. 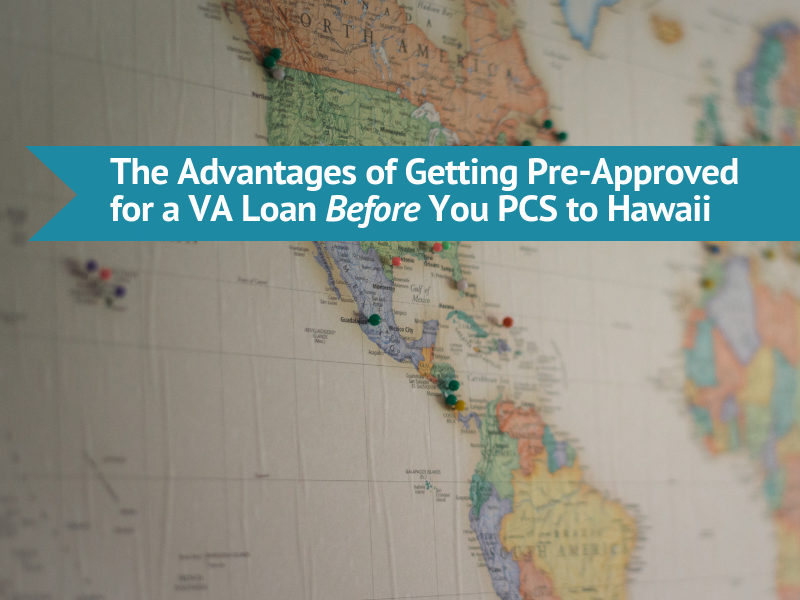 In summary, how does getting pre-approved for a VA loan before you PCS to Hawaii translate to an easier and advantageous home buying process for you? Pre-approval will get you connected with a Hawaii real estate agent to immediately begin house hunting with you when you arrive on island (or even from a distance before you arrive). Pre-approval will give you an accurate home price to help direct your home search. Pre-approval ensures that when you make an offer on a home, it will be seriously considered and accepted by the seller and their agent, because they know you’ve taken the steps to make yourself a firm buyer in Hawaii’s real estate market. When it comes to VA home buying, 2-6 months is not too early to begin the process. Once you have PCS orders, get started! Contact us or fill out our short and secure loan application and we’ll get in touch with you. For servicemembers being PCSing to the following three main Oahu bases, download a free PCS Guide that details the history, surrounding neighborhoods, schools, food & recreation, and housing market data surrounding each base: Joint Base Pearl Harbor Hickam, Marine Corps Base Hawaii, and Schofield Barracks. What Does It Mean for a Condo to Be "VA Approved with Conditions?"